Crack of Dawn Crafts: Some THINGS to Help Celebrate Dr. Seuss! Some THINGS to Help Celebrate Dr. Seuss! March 2nd, Dr. Seuss' Birthday! 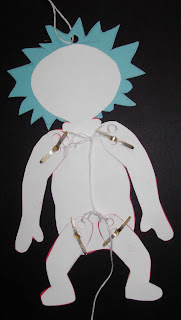 Cut out the template, punch holes, and glue the colored pieces on top of poster board pieces. Assemble by pushing brads through lower holes on arms and legs. With the Thing in arms/legs down position (standing), tie string/floss through top holes of appendages, connecting arms to arms and legs to legs (loose tie is ok). Use a longer piece of string/floss to tie arm string to leg string, and leave a length at bottom for pulling. Punch a hole in top of Thing's hair to insert loop for hanging. Tie a golden ring (old pirate treasure?) if you like, to the bottom string for easy pulling. If your Thing's legs/arms get stuck when pulling, try loosening the brads a bit. I am a huge Seuss fan. I decorated my living room in "seuss" flavor this year. It made me smile everytime I looked in to the room. 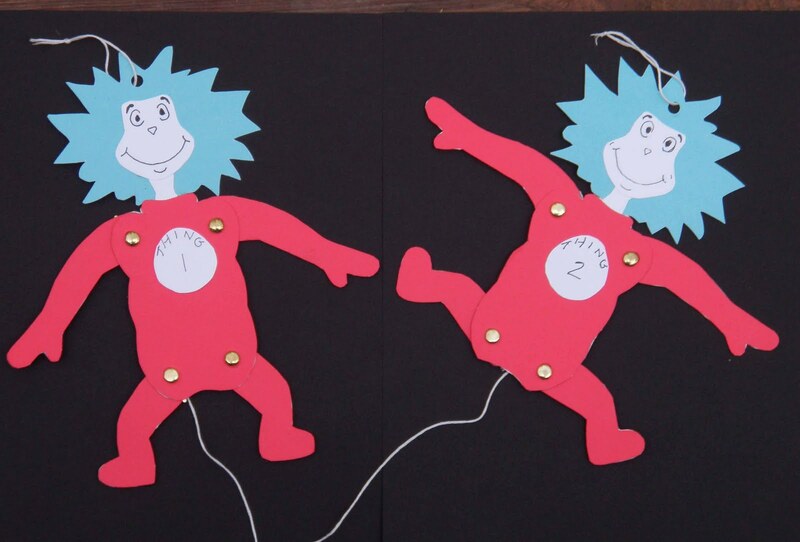 If you have a chance stop by my blog sometime, I have pics up of my "seuss decorations". So cute! We are for sure making these today. Thank you thank you for sharing. I cannot seem to open the pattern either and would love to do it with my class(I teach special ed.) and my daughter's daycare group. :) If you can email it that would be wonderful. dawnmgamble@gmail.com Or if you have tips on opening it... You have such cute stuff! I'm so sorry for your trouble... I'll send it right away. Are there other ways than Scribd to post pdfs to a blog? I'm honored that you can use them! I cannot open it either. Could you please send it to my email? There will be a button in orange to download or print. Meanwhile, I'll go check the html on this post right now.